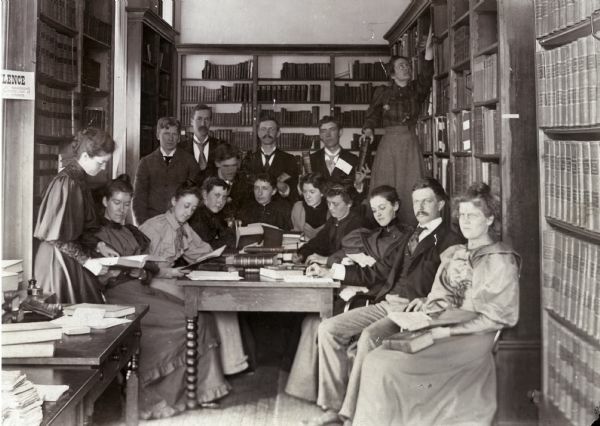 Frederick Jackson Turner with his History Seminar in an alcove of the Historical Society rooms in the third Wisconsin State Capitol, about 1893-1894. Back row, from left: W.B. Overson, J.M. Johnston, Joseph Schafer, Charles L. Baldwin, and Florence Baker Hayes (staff). Front row, from left: Emma Hawley (staff), Estelle Hayden, Kate Bucknam, Ada Taylor, Annie Pellow, Dena Lindley, Sadie Bold, Flora Barnes, Turner, and Catharine Cleveland. The young man in the center, bending over, is E.F. Dithmar. The table around which the seminar students are gathered is identical to the journalists tables in Image #23174. Crafted in the Jenny Lind style, these tables were probably early furniture purchases for the Capitol.